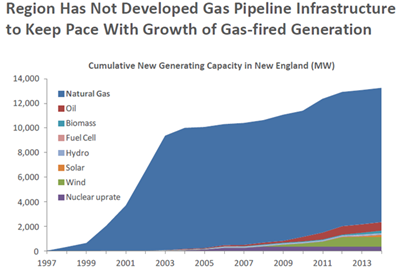 As explained in Part 1, New England is suffering a real energy crisis caused by a lack of natural gas pipeline infrastructure. The crisis was bad this winter, would have been much worse without the luck we experienced, and could easily get worse in the future. A large part of the solution is expanding natural gas pipeline capacity. A smaller but significant part of the solution involves increased energy efficiency and use of renewables. To understand the potential of energy efficiency and renewables, one must have a handle on some New England energy market basics. ISO New England (ISO) is the independent regional grid operator charged with ensuring power grid reliability and administering the energy markets. To satisfy its reliability mission, ISO has developed a “Forward Capacity Market” (FCM). The “capacity” of an electric generator is the maximum amount of electricity it can produce at a given moment, measured in megawatts (MW). The amount of electricity a generator actually produces over a period of time is called “energy,” usually measured in megawatt-hours (MWh). A garden hose is a useful analogy. With the water turned on fully, the hose’s entire capacity is used. With the water half on, half of the hose’s capacity is used. The water flowing through the hose over time is the total “energy” consumed. Through the FCM, ISO is required by law to procure sufficient electric generation capacity to meet the highest projected point of electricity demand (with a buffer). ISO effectively must create a “hose” large enough to supply the maximum amount of water New England will need at 1 p.m. on the hottest summer day. For 2015, ISO was required to procure 34,498 MW of electric generation capacity through the FCM to ensure reliability, with that number increasing to 35,142 MW by 2018. The 34,498 MW threshold is called the Installed Capacity Requirement (ICR). Of the current ICR about 31,000 MW is electric generation capacity in New England, with the remainder comprised of imports from nearby regions and demand response. Over 15,000 MW of New England’s generation capacity can be fueled by natural gas, primarily highly efficient combined-cycle generators constructed since 2003. New England’s other electric generation capacity is fueled by coal, oil, nuclear, hydro, wind, solar, or refuse. The critical takeaways to remember as you continue reading are: (1) ISO is legally obligated to procure 34,498 MW of generation capacity, so that when electricity demand reaches its peak, these resources can be switched on to reliably meet our power needs; and (2) about 15,000 MW of New England’s generation capacity is primarily fueled with natural gas (though some has the ability to burn oil instead). The only characteristic unique to New England is its extraordinarily high electricity prices caused by insufficient pipeline capacity. Now let’s discuss the benefits provided by energy efficiency and renewables so far, along with their potential and limitations going forward. We should be proud that New England is the national leader in energy efficiency. As ranked by the American Council for an Energy-Efficient Economy, Massachusetts is, and has been for several years, first in the nation, four other New England states are in the top 10, and all six states cracked the top 25. In 2012, ISO developed the nation’s first multi-state energy-efficiency forecast to capture the long-term impact of energy efficiency. The forecast projects that from 2019 through 2024, energy efficiency measures will: (1) save about 9,696,000 megawatt-hours of energy, and (2) shave approximately 1,274 megawatts of peak demand (thus eliminating the need for several utility-scale electric generators). New England has invested about $3 billion in energy efficiency programs from 2009 to 2013, and will continue to invest approximately $1 billion annually over the next decade. As a result, regional energy consumption over the next decade will remain essentially flat and growth in peak demand will be significantly tempered. While energy efficiency is critically important, the region must first have a reliable energy portfolio to use more efficiently. 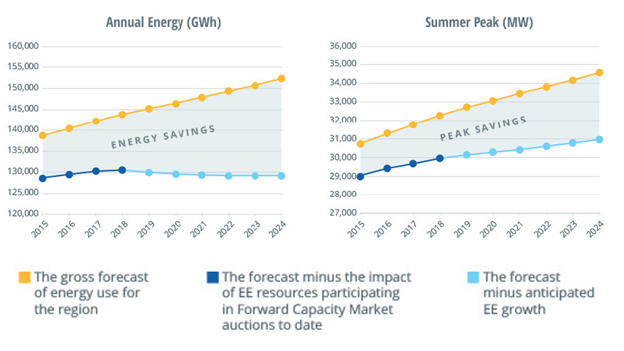 The 1,274 MW of reduced peak demand that billions of dollars of energy efficiency investments will bring to bear by 2024 will represent a relatively small part of the overall energy mix. · In the context of the current 34,498 ICR, 1,274 MW of efficiency represents only about 3.7%. The ICR is expected to grow to over 37,000 MW in the next decade. · Of New England’s 15,000 MW of electric generation capacity fueled by natural gas, but which often cannot obtain fuel during winter, 1,274 MW of efficiency represents only about 8.5%. · Of the 8,300 MW of “at-risk” coal- and oil-fired generation capacity in New England, 1,274 MW of efficiency accounts for only about 15%. While energy efficiency must and will be a part of replacing antiquated generation capacity and meeting future ICRs, it cannot replace 8,300 MW, fill in for 15,000 MW of natural-gas-fired generation capacity during the winter, or meet all incremental demand. Even assuming a doubling or tripling of projected efficiency benefits, New England still faces a worsening energy crisis. Renewables are another increasingly important part of the region’s energy mix. Before getting into the benefits of renewables, one must understand how they fit into ISO’s FCM. Renewable energy varies hourly, daily, seasonally, and with weather events. Because of this intermittency, renewable generation cannot be dispatched by ISO as it is needed. Rather, ISO takes renewable energy whenever it is being produced. Nonetheless, this energy is valuable because it produces few or no emissions. Further, because the renewable “fuel” costs nothing, it causes electricity prices to decrease. But when renewables are not producing electricity ISO still must still ensure that electricity supply instantaneously matches demand. In the FCM, ISO must discount the value of intermittent renewables because it has no assurance that they will be generating their maximum electricity output during peak demand. Roughly, based on complicated formulas, solar gets credit for 50% of its electric capacity, and wind gets credit for 20%. For example, to replace 8,300 megawatts of “at-risk” coal- and oil-fired generation in the FCM, ISO would need to procure about 41,500 MW of wind, which is more than all generation capacity currently existing in New England. Wind, solar, and all other renewable sources of generation (except pumped storage) currently make up only about 9% of the region’s capacity. But wind and solar resources are growing quickly, spurred by state “Renewable Portfolio Standards,” tax credits, and plummeting technology costs. In 2010, there were only about 50 MW of solar in New England. In less than five years, solar capacity has grown to over 900 MW, equal to one of the region’s larger power plants. ISO has developed a first-in-the-nation long-term solar forecast to project the future impact of solar in the region. The 2015 solar forecast predicts that by 2024, about 2,500 MW of nameplate solar is anticipated, which will produce about 2,600 GWh of annual energy. This could account for up to 17% of energy in certain hours and supply about 2% of the region’s overall energy needs. While solar-powered generation is extremely valuable, especially during the summer when demand is highest and the sun is shining bright, it cannot physically produce electricity during the peak winter demand, which usually occurs between 6 p.m. and 7 p.m. At this time, pipeline constraints are the worst because people and businesses use almost all of the natural gas pipeline capacity for heating and cooking. Additionally, the 2,500 MW of solar projected to be on-line by 2024 will be discounted by approximately 50% in the FCM. When this solar capacity is operational, it will represent less than 7% of the region’s required ICR. When you consider that this added solar capacity will also help offset a portion of the 8,300 MW of “at risk” coal- and oil-fired generation capacity, it is clear that much more than solar is needed. Wind is another piece of the complicated energy puzzle, which has recently experienced tremendous growth. In 2005, there was 2 MW of wind capacity in New England. Today, there is over 700 MW, with another 4,000 MW of new wind resources in development, accounting for about 36% of all the proposed new power resources in the region. While this is a positive step towards achieving our environmental goals, wind presents the additional challenge of often being located in remote regions of New England far from areas of high demand. This requires the construction of hundreds of miles of transmission lines. ISO is addressing these challenges through a variety of studies. In 2010, the ISO conducted the New England Wind Integration Study (NEWIS) to analyze how large amounts of wind energy could be integrated into New England’s power system operations without affecting reliability. ISO has subsequently implemented a centralized wind power forecast in phase one of its Wind Integration Project, providing more precise information about when, where, and how much power can be expected from large wind farms. The second phase of the Wind Integration Project should be completed in 2015. In December of 2014, ISO also instituted a major change to its electric markets, allowing negative offers for the first time. Negative price offers allows wind resources to be more competitive during times when there is excess generation on the system. Effectively, when it is too expensive for large baseload generators, such as coal and nuclear, to shut down or curtail production, they pay to keep producing electricity. Even assuming all 4,000 MW of wind being developed is actually constructed and transmitted to demand centers, this capacity will be discounted in the FCM. In total, 4,700 MW of wind capacity is equivalent to only about 940 MW of “dispatchable” (i.e., controllable) generation capacity, or less than 3% of the current ICR. Combined, energy efficiency, solar, and wind will contribute to solving New England’s energy crisis, but the reality is that natural gas is needed too. As intermittent renewable energy accounts for a greater percentage of total energy production, New England’s fleet of dispatchable generation capacity becomes increasingly important to balance unexpected and large swings in renewable energy. Currently, natural gas-fired generation is the best balancing capacity resource. Natural-gas fired generators are relatively easy to site and cheap to build, meaning they can be strategically located to pair with wind and solar resources and thus avoid the need for huge transmission investments. More importantly, they are highly efficient, fast-start, and can ramp production up and down within minutes. No other generation technology has these valuable attributes. However, to utilize these attributes, the natural gas-fired generators already constructed in New England must have access to reliable fuel supply, which means they must be connected to one or more natural gas pipelines that can provide them with enough fuel to operate at full throttle when renewable energy unexpectedly drops to near zero. Currently, natural gas pipelines in New England are fully utilized for much of the winter to provide heating fuel. The natural gas generators sometimes cannot access natural gas at all, and at other times, it becomes so expensive on the constrained pipeline system, that inefficient oil, propane, and coal generators are dispatched instead of natural gas generators. This drastically increases cost and emissions, while limiting the potential of existing natural gas-fired generators to integrate increased amount of renewable energy into the grid. Natural gas opponents argue that New England can invest in either natural gas or renewables, but that is short-sighted and reflects a fundamental misconception of New England’s energy markets. While we need to continue to expand our reliance on renewable energy, New England’s energy infrastructure must be sized with enough capacity to power the entire region when the sun doesn’t shine and the wind doesn’t blow. The fleet of highly efficient, fast-ramping natural gas-fired generation that New England has already built must be assured that it has adequate natural gas supplies to run at full output. This means that regional pipeline infrastructure must be expanded significantly, so these generators can have reliable access to fuel at a moment’s notice. Over time, the overall energy output from these generators can decrease, as renewable energy output increases, but only if the generators are able to fully ramp their output levels at any given time. The Coalition to Lower Energy Costs is a non-profit Massachusetts association of individual consumers, labor unions, larger energy consumers and institutions concerned about the threat to New England’s families and economy from skyrocketing natural gas and electric prices. The coalition advocates for the new infrastructure we need to give all of us access to an adequate natural gas supply and lower our energy cost. This will require substantial new pipeline capacity, including one new pipeline from western Massachusetts to Dracut.